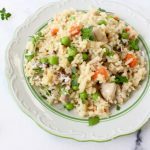 This easy chicken and rice recipe is the perfect go to weeknight dinner for when you have to feed a crowd, or cook extra for leftovers. 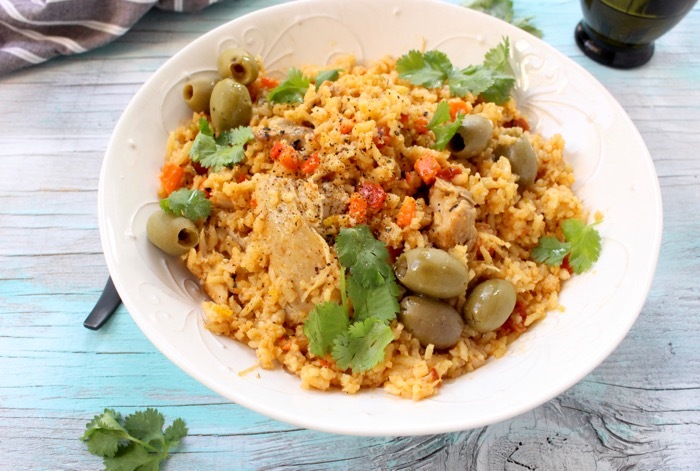 A spin on your classic Spanish Arroz con Pollo, my easy chicken and rice recipe is made with quick cook brown rice, boneless skinless chicken thighs and a little secret help from McCormick Organics Taco seasoning mix. 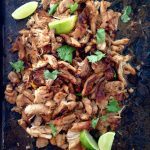 I chose the Taco seasoning package to sprinkle the chicken all over, before quickly pan searing on both sides. It has similar spices to what I would normally use to make this dish, only conveniently mixed together in one spot. 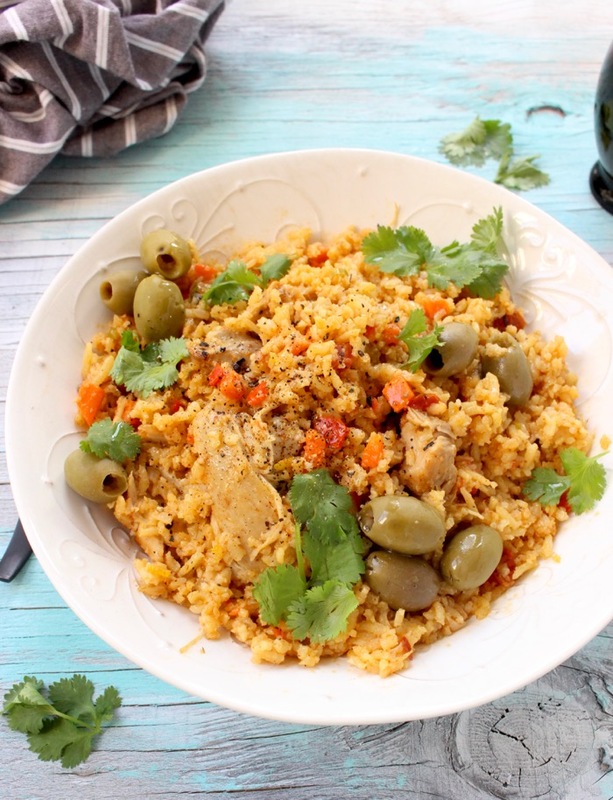 Then I took advantage of those delicious drippings to sauté my sofrito, and quickly toast the rice before cooking everything together with the fire roasted tomatoes, in one of most flavorful weeknight dinners of easy chicken and rice. 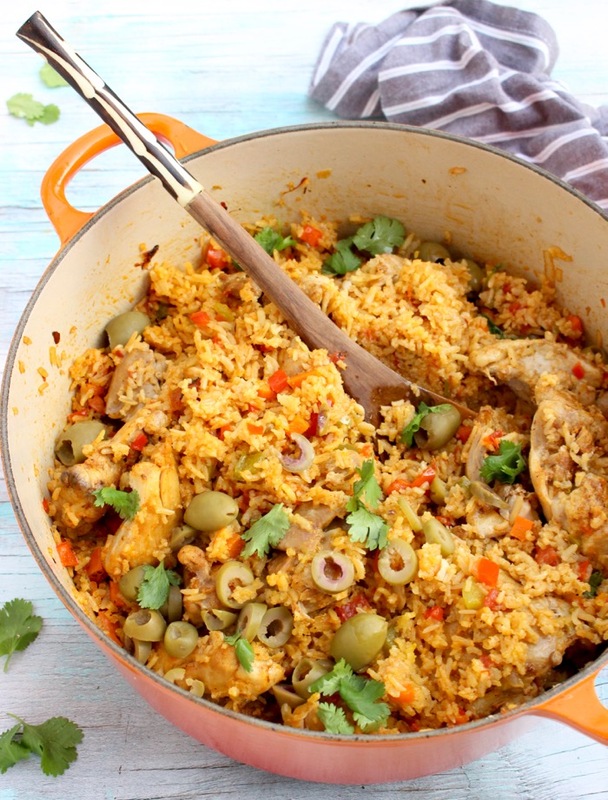 You can easily entertain a family dinner with this, feed 6 hungry people, or simply have delicious leftovers for a couple of days. Packs really nice for lunches to go as well, a major plus in our family. 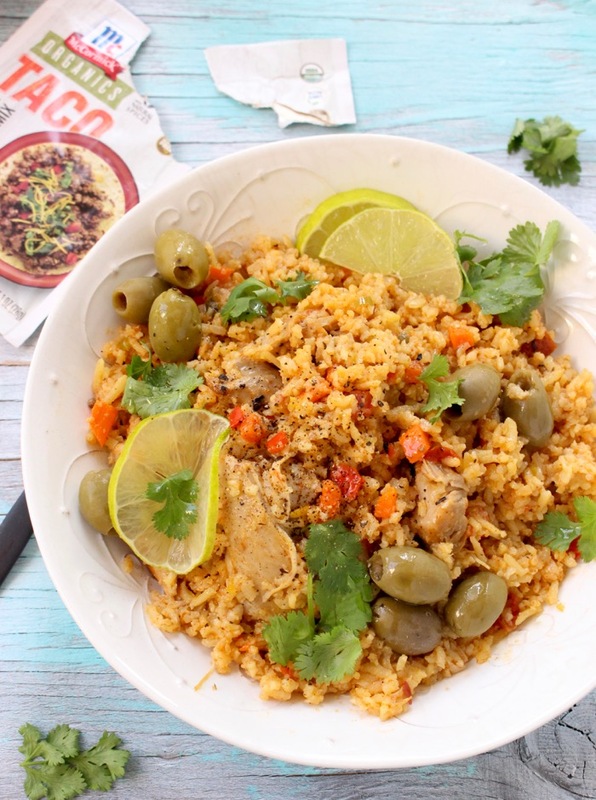 My favorite part has to be that I can make this using quick cook brown rice that is not stripped of nutrients, and i can have a lovely dinner on the table in under one hour on a Tuesday. While my easy chicken and rice is cooking I can easily chop up this cucumber tomato salad to go with it. These two combinations together never fail me. Taco Seasoning Mix, the star in today’s easy chicken and rice dinner! 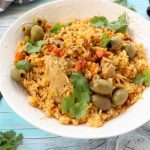 A spin on your classic Spanish Arroz con Pollo, my easy chicken and rice recipe is made with quick cook brown rice, boneless skinless chicken thighs and a little secret help from McCormick organic spice mix. Using some paper towels make sure to pat dry as much of the moisture from the chicken as possible. 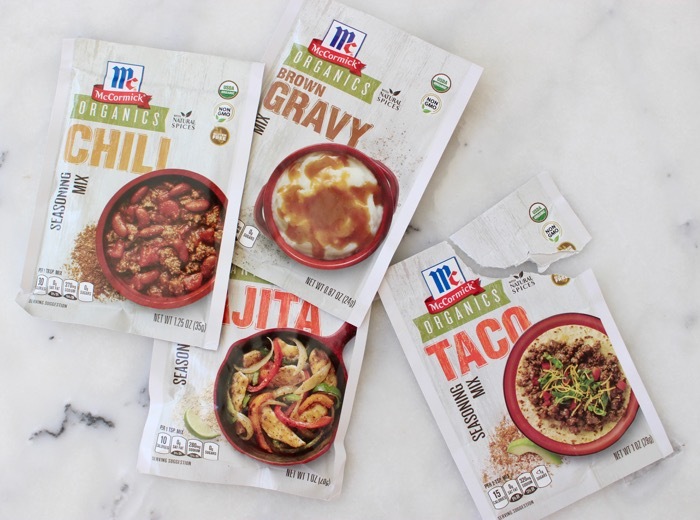 Drizzle the chicken with a lug of olive oil and sprinkle with the McCormick taco mix all over. Heat up a large skillet on medium flame. Add a little olive oil, just enough to coat the pan and quickly pan sear the chicken on both sides until nicely golden brown. Take good care not to burn it. Transfer to a plate and keep warm. Add the onion to the pan with a pinch of sea salt and a little more olive oil if needed. Sauté for a few minutes then add the carrot and bell pepper. Cook the sofrito together for a few minutes then stir in the garlic, smoked paprika and rice. Toss to coat well. At this point you can add the chicken thighs back to the pan together with the diced tomatoes, bay leaf and sea salt. Pour the water over the top and bring everything to a gentle simmer. Cover with a tight lid and cook on low flame for 25 minutes. Remove from heat and let the chicken and rice sit covered for 10 minutes. 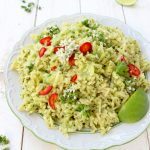 Discard the bay leaves, fluff the rice with a fork and serve sprinkled with the green olives, fresh cilantro and a nice drizzle of extra virgin olive oil. I prefer my recipes easy. This one looks yummy too!